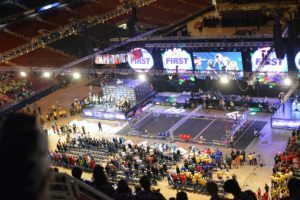 Ten days after the New England Championships, our team embarked on a 23 hour drive to World Championships hosted in the Edward Jones Dome. Our team shared a bus with the District Championship Rookie All-Star Award recipient, Andromeda One (4905). From the 23rd to the 26th of April, Mayhem competed in the Archimedes Division at Worlds with 99 other high-caliber teams. We continued undefeated for nearly half of the tournament and ranked 14th seed with eight wins and two losses. Although we were not picked during alliance selection, we won the judge-appointed Team Spirit Award sponsored by Chrysler which “celebrates extraordinary enthusiasm and spirit through exceptional partnership and teamwork furthering the objectives of FIRST” (“Awards”).